This is a simple idea, not really deserving of a whole blog post, but we thought it made sense to articulate it somewhere more fixed than an Instagram post. So what does everybody think about doing a wip [work in progress]-down in Lent? That means we spend the next six weeks working on finishing off projects that we have hanging around, rather than starting new ones. * Most of us probably have a sad wasteland of half-finished projects and it’s easy to be tempted by new projects instead of revisiting that place and giving the old projects the attention they deserve. Let’s encourage each other to go to the desert of unfinished things and spend some time working on them this Lent! Lent is a season for fasting, self-examination and preparation before Easter, and a wip-down is not the only way we will be trying to fulfil those Lenten demands (Hanna will also be attempting to give up sugar – yikes!) But it is an appropriate Lenten challenge because it will involve both discipline, in forcing yourself to pick up that boring old half-done sock. and self-denial, in ignoring that luscious new skein that’s begging to be cast on. There’s nothing religious or denominational about the wip-down, sp whatever your reasons for wanting to keep Lent (or tackle the wip mountain! ), you are more than welcome to join in with us in resolving only to work on old unfinished projects from 1 March until Easter (Sunday 16 April). We can use the hashtag #lentenwipdown on social media to cheer each other on, and we will check in here intermittently to keep a record of our own progress. So who else is in? Let us know in the comments, or pop over to Instagram, where we are @hannapatchaesthetic and @lucypatchaesthetic. And good luck! *Unless they are urgent gift projects – Lent is about denying yourself, not denying others. And if you have so few wips that you finish them all off before the end of Lent, you are entitled to feel very smug and then of course do what you like afterwards . So, yesterday, I walked past the Cambridge city centre branch of the high street women’s clothes shop Warehouse, and this dress was on a mannequin in the window. I don’t mind telling you, my reaction was a bit like this pug‘s (linked because you’d never get the rest of the way through the post if I put that GIF in it). Instant enchantment, in other words. Whoa – I haven’t had that reaction to a piece of high street clothing in a long time. Then today, I did something I haven’t done in even longer: I went into Warehouse. It was strangely bright and cramped in there, and there were lots of things made of polyester, but I found the dress and tried it on, and wow! it felt great and looked (I thought!) pretty great and I thought about buying it, I really did. I got some compensation money from my gas company this month for some historic billing f**k-ups, and it would have more than covered it. I was so tempted. Then I thought: no, I could make this (simple bodice, elasticated waist, A-line skirt) and anyway, it didn’t have pockets, which seemed like a really stupid omission. A dress like that is begging for you to put your hands in deep pockets and slouch a little! In fact, I think the model below is trying to do it and that’s why her hands are hanging in that weird way…sorry, I digress. I came back and looked at my patterns, and chose two I could mash up (McCall’s 5927 for the bodice and sleeves, Sewaholic Saltspring for the waistband and skirt – with pockets because Tasia of Sewaholic is a sensible woman). 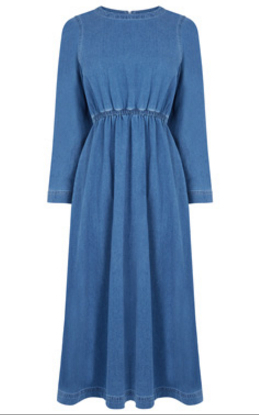 I even started browsing for organic denim I could buy, since I don’t have a big enough piece in my stash; I reckon it would need at least 3.5m of wide fabric for a tea-length A-line dress with long sleeves. But in the course of that browsing I re-read So Zo’s musings on organic cotton and decided that it would be unethical to buy new fabric, organic or not, so I will just have to wait till I find something suitable second-hand. In case you’re wondering what the point of this post is, sorry – and thanks for reading so far – but I don’t really know. It just felt significant that all I’ve read and thought about ethical textiles and conscious consumption and the global garment industry is now actually strong enough to overpower even the sudden mad rush of falling in love with a garment, a rush which took me over the threshold of one of the despised high street shops I usually avoid like the plague, and to the point of contemplating giving them money. I guess maybe I want to say that being part of an online community of thoughtful, caring, responsible makers (like Zoe and Felicia and Karen) can actually make a difference to behaviour, that actually we can encourage and support each other to consider the interests of exploited garment workers and the environment above our own selfish desire for clothing gratification. * Consciousness-raising FTW! *obviously I don’t know who actually makes clothing for Warehouse and what their working conditions are – but since I don’t know that they aren’t exploited, I have to assume that they might be. While reflecting on what Slow Fashion October might mean for me, I have found myself returning repeatedly to the word ‘slow’, and its various implications. I sew and knit, but I have never participated in Me-Made-May, mainly because I inevitably recoiled from that sense of pressure – to make pledges, to take photographs, to make and finish garments quickly in order to have enough suitable things to wear, and to wear things for the sake of the pledge, rather than for any of the other reasons one might decide to dress in any particular way, ‘me-made’ or not, during the month of May. Slow Fashion October appeals much more to my nature, and is a far more realistic fit with how I think about my wardrobe as a mixture of me-made, thrifted, and other garments, and with how my sewing and knitting projects are a welcome ‘slow’ aspect of my life. In our professional lives as academic researchers, Hanna and I are both fairly used to progress and achievements happening slowly, over months and years. ‘Slow’ goes without saying in that context – and can be a challenging, frustrating, and sometimes overwhelming feeling. I want to think more about the relationship between these two spheres – crafting, and writing – but for now, I’ll stick with how I hope Slow Fashion October will work for me. In both academic research and crafting, it’s very easy to feel guilty about ‘slow’ progress, unfinished projects, things not yet achieved. I want to use this month to focus on a more positive relationship with sewing and knitting projects that have slowed down to a complete halt, and to pick them up not in a rush to meet a deadline, or out of a sense of guilt, but with a focus on the good things about the ‘slow’ nature of craft. So, during my Slow Fashion October, I will attempt to finish a couple of projects. One is Ysolda’s Blank Canvas sweater, which I started in March 2014, when Hanna and I were away on our annual writing retreat. I have the sleeves and most of the body, so just need to join them and finish the shoulders and neck. 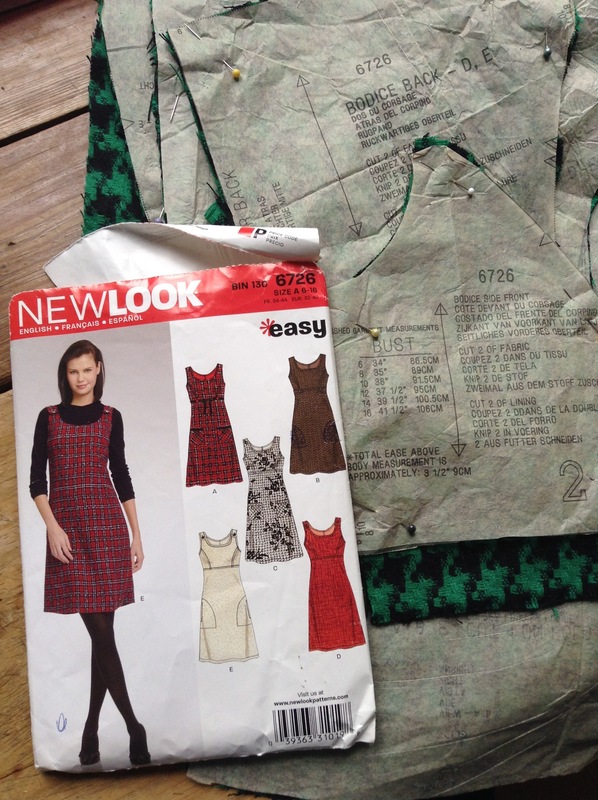 Another is a pinafore dress, New Look 6726, in a black and green large houndstooth woven wool blend. The fabric was a gift from my sister, and I cut out the pieces for the dress in October 2014 (see below). Finally, I have a Marks & Spencer size 18 skirt, in green needlecord, which I bought for £3 in a Norfolk charity shop earlier this year. It has pockets and a buttoned panel closure down the front, is completely unworn, and crying out to be remade into a skirt that fits me. Well, this basically rings all our bells here at Patch Aesthetic, so count us in! We’ll be using Karen’s weekly themes as a jumping off point for musings on everything to do with slow fashion. October is a great month for this. As Karen points out, it’s peak international fashion season, and a time when even on the high street the culture of consuming clothes is revving up. That back to school feeling and the sinking temperature are almost inseparable from thoughts of a new winter wardrobe, as if we can signal our return to focus and efficiency after the lassitude of summer with a closet full of new coats, boots, and tights. And just over the horizon looms Christmas, with its emphasis on consumption of all kinds, as well as the strange mania that can be induced by clothing catalogues full of sparkly party dresses (oh Boden, how I love hate thee). For me, October and November are two of the busiest months of the year, a whirl of lectures, talks, and teaching, while the approach of December sends me into a spin of making presents. Before all that takes hold, Slow Fashion October seems to offer a perfect breathing space; the chance to slow right down and put some thought into what I wear/want to wear, and why. As it happens, I’ve already spent quite a lot of time this year cultivating a more conscious and thoughtful approach to my wardrobe. With the idea that I might participate in Me-Made-May, I decided to spend April doing an audit of my style and my wardrobe using the excellent Colette Patterns Wardrobe Architect series. That gave me a much clearer concept of the ethos, shapes, and colours that were important to me, but I still felt I had too much stuff. So instead of doing Me-Made-May, I spent that month getting rid of vast amounts of clothing (and shoes, accessories, books, household goods etc) using the KonMari Method; I also organised and catalogued my stash of fabric and wool. (I’ll write more about both of those processes another time.) The result is that I am much happier with the volume of my possessions, and have a good idea of what kinds of things I should make. 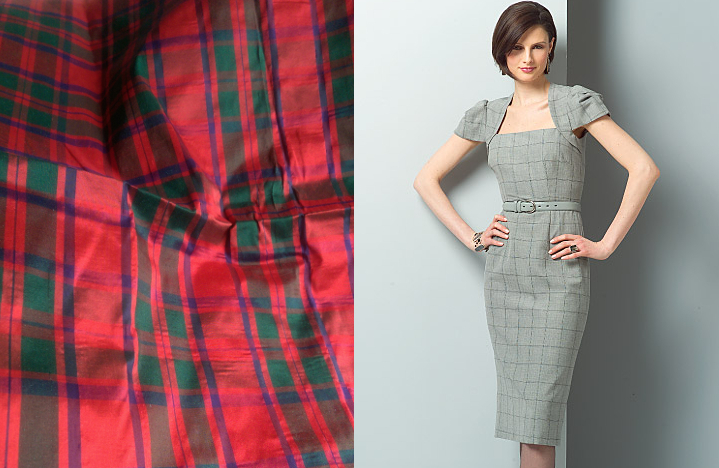 Bad: Tartan silk taffeta + V8280 (Vogue’s version of the legendary Galaxy Dress, which turns 10 this year). But of course, as the weather cools and life gets busier, I’m still tempted when I walk past shops and see beautiful coats or brogues – and I have escapist dreams of making my next sewing project a tartan silk taffeta co￼cktail dress (see above). Slow Fashion October is the reminder I needed to stay true to my goal of having a better relationship with stuff in general and with my wardrobe in particular. It also seemed like a great reason to start that blog that Lucy and I have been talking about for years, and so Patch Aesthetic is here! 4) to use this blog to reflect on fashion, craft and sustainability, and to connect with other crafters on social media. Readers, what does slow fashion mean to you? Do you have any plans for Slow Fashion October? Let us know in the comments! 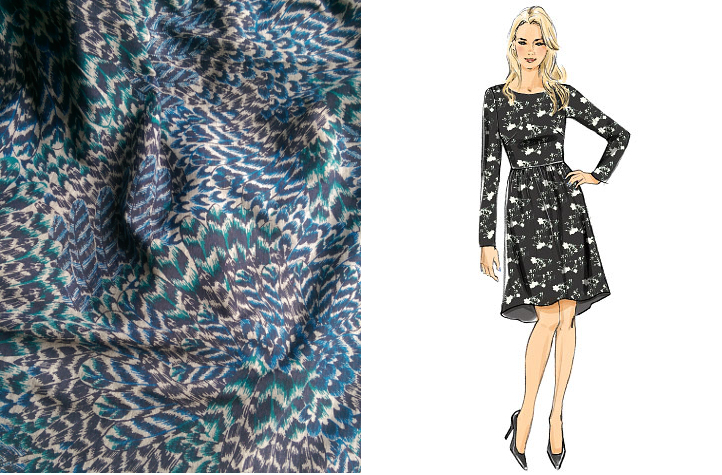 Good: blue-grey feather print jersey + B6086.